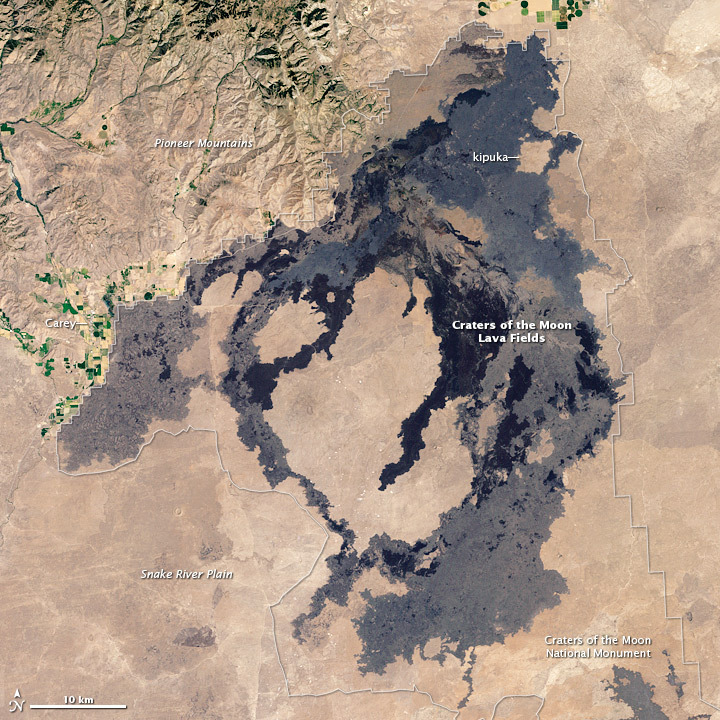 Craters of the Moon lava field is a striking area of recent volcanic activity within Idaho’s Snake River Plain. The 60 (or more) lava flows in the field range from approximately 15,000 to 2,100 years old. Together the flows cover 1,600 square kilometers (620 square miles) with a total volume of 30 cubic km (7.2 cubic miles). A 3-D view of Craters of the Moon shows the Snake River Plain in relation to the adjacent mountains. This natural-color image of Craters of the Moon was acquired by the Enhanced Thematic Mapper Plus (ETM+) aboard the Landsat 7 satellite on August 1, 2001. 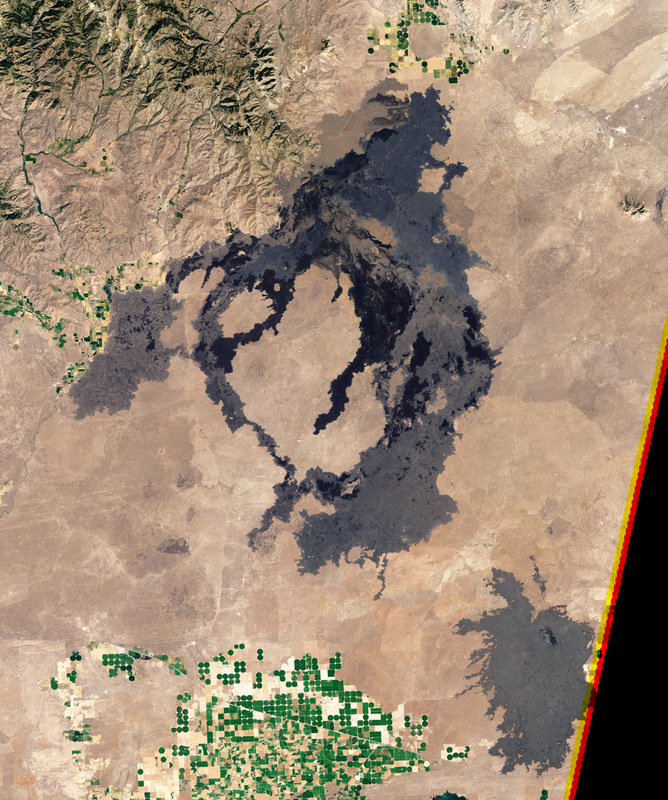 The lava flows appear black, dark brown, and even dark blue. 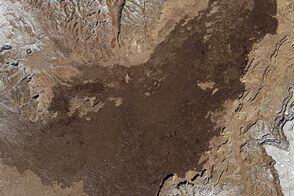 Thick vegetation (forest in the Pioneer Mountains and irrigated fields on the Snake River Plain) is green, while the scrubby vegetation surrounding the lava field appears brown. Scrub-covered areas surrounded by lava flows are called kipukas. NASA Earth Observatory image by Robert Simmon, based on Landsat data from the USGS Global Visualization Viewer. Caption by Robert Simmon. Craters of the Moon lava field is a striking area of recent volcanic activity within Idaho’s Snake River Plain. Kuntz, M.A., Skipp, B., Champion, D.E., Gans, P.B., Van Sistine, D.P., and Snyders, S.R. (2007). Geologic Map of the Craters of the Moon 30’ x 60’ Quadrangle, Idaho. Accessed October 12, 2009. National Park Service. (2009, October 8). Craters of the Moon National Monument & Preserve. Accessed October 12, 2009. USGS. (2003, January 22). Craters of the Moon Volcanic Field, Idaho. Accessed October 12, 2009.